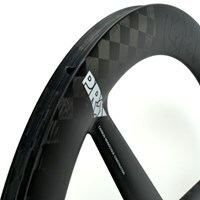 PRO has launched what is claimed to be the fastest time trial wheel in the world. The 3-spoke wheel is reinforced by TeXtreme® and co-created with Team Sky. It was unveiled at the opening team time trial at the Vuelta a España. 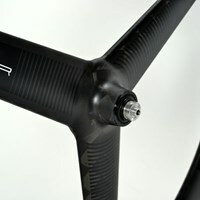 TeXtreme® is the next generation carbon fiber material in the bicycle industry; it is based on using Spread Tows instead of yarns to achieve ultra light weight and high-performance products. Companies utilizing the TeXtreme® Technology in general achieve better properties on weight, stiffness, strength, etc. compared to those using other carbon fiber materials. "With the selection of materials, we've been extremely picky. We used a mix of high level uni-directional (UD) fibers and Spread Tow fabrics. The outside TeXtreme® layers have a double function. They keep the weight down and give a match in appearance with our rear TeXtreme® disc wheel." says Leon Van Strien, Product Manager of PRO. The PRO concept of co-creation has been applied also on this wheel where the engineers at PRO along with riders from Team Sky have come up with the combination of materials used and its characteristics. Previous cooperation’s involve the successful PRO TeXtreme® disc wheel. Alongside the bike industry current TeXtreme® users can be found in Formula 1, Americas Cup, golf shafts, surf boards, aircraft interiors, rowing boats, skis, snowboards, ice hockey sticks, NASCAR and various industrial and advanced aerospace applications. PRO is the master of co-creation. At PRO we have a simple mission: To work together with the best people in the world to make the best products in the world. That’s why we work with the best riders, designers and The Shimano Dynamics Lab to co-create the products you use. The pro’s who put their name to our products are not just figureheads – they actually help design, prototype, test, modify, improve and fine-tune the most important bits on your bike. They push our products to and often beyond their limits – on some of the world’s toughest road, trails, mountains and tracks. www.pro-bikegear.com.